Does anyone know how I can make a staircase that has wider width at the bottom and a narrower width at the top so that it forms a trapezoid from an aerial view? I'm not sure there's an easy way to do this. 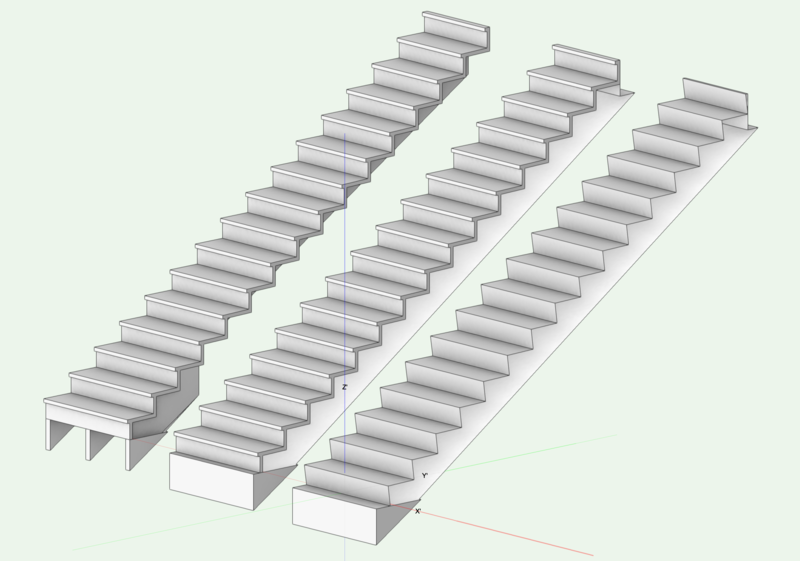 I was going to suggest making a rectangular version of your stair using the Stair Tool, ungrouping it twice to get the 2d and 3d elements, and then slicing it using the Split Tool but the 3d portion ungroups into a mesh which isn't slice-able. Figured it out. Thank you for your help! But do tell us what approach worked for you. It's entirely likely your solution might solve other similar issues I've run into in the past and sure will in future. I created a regular staircase using Simple Stair. From a Top/Plan view, I used the Polygon tool to draw triangles over the parts of the staircase I didn't want. Next I extruded them to be the same height as the top tread. Finally, I used Subtract Solids to remove the triangular prisms from the staircase. Sweet! Nice and simple. Thanks, much appreciated. That's an interesting approach. I like that the stair can still be edited in the solid subtraction. In testing this method I found that it exposed the empty geometry of the Stair PIO. Did you model some custom geometry to account for that? Example stairs cut with a solid subtraction - stringer / solid / concrete - note the open sides and stringer that's hollow when cut. Clearly you would need to more to make them usable in real world situations. Very interesting! I made my staircase with the Simple Stair tool and I did not get the empty geometry. I tried the same thing with the Stair tool and got the same result as you. It seems as though the Simple Staircase automatically resolves this issue! This is good to know. When ungrouping a Simple Stair it decomposes into extrudes, which is what I would expect from a PIO. It section and shows in the clip cube properly too. Great information. Funny that I had to add the Simple Stair to my workspace manually to be able to use it. Funny that I had to add the Simple Stair to my workspace manually to be able to use it. And where again does one find that tool to add it to Spotlight workspace? Or is it Architect / Designer spaces only? See Vectorworks Help for more info on this tool. thanks Jeremy. Found and installed. Can't wait to have a reason to use it. NNA fanfares that VW is a solid modelling environment with the obvious benefits this brings to manipulation/change such as highlighted here. Yet simple stair (and custom stair) is now 'legacy' and is tucked away in preference to (all singing, all dancing????) Stair Tool, which as Kevin illustrates, clearly does not provide the promised/expected geometry. Nor (as discussed widely) does it offer anything close to a simple, user friendly, robust design tool for professional use - as it ought. For clarity; The Simple Stair tool is not legacy. Unless you have used Migration Manager and omitted new additions since the version it was first featured in, you can find it in the Building Shell toolset when using the following Workspaces; Fundamentals, Landmark and Spotlight. It seems the Simple Stair tool is intended for users in industries where use its use is infrequent and complexity unwarranted, hence users of Vectorworks Architect have to manually add it if needed.